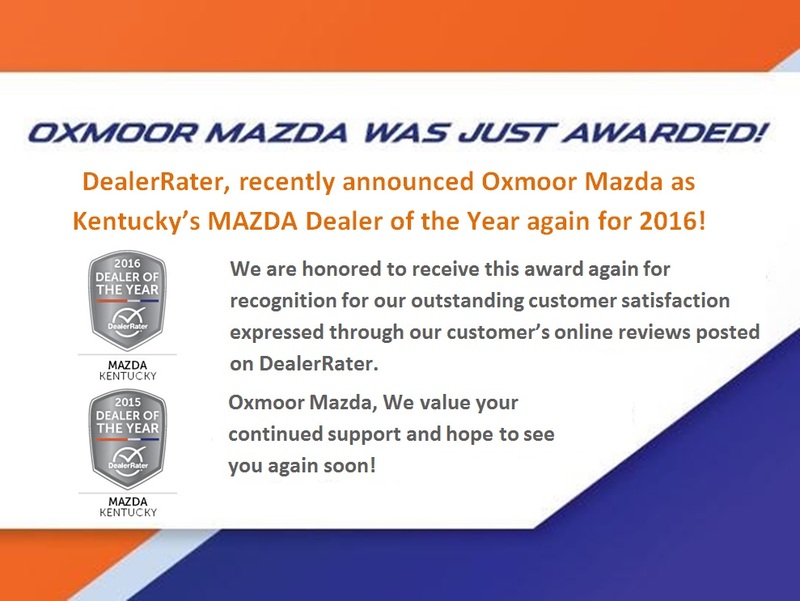 Oxmoor Mazda in Louisville, KY, is proud to be an automotive leader in our area. Since opening our doors in 2005, Oxmoor Mazda has held firm on our commitment to provide world-class vehicles and superior customer service. We offer a wide variety of new Mazda vehicles, and quality used cars, and we strive to make the car buying process as quick and hassle-free as possible. If you are in the market for a new Mazda, or a used car, truck, or SUV, contact our Louisville Mazda dealership today. The experienced professionals in our auto financing department will work with your budget and available Mazda incentives to find the right car loan or lease option that works for you. You can trust that Oxmoor Mazda will help find the new car you’ve been searching for, with professionalism and attention to your needs. At Oxmoor Mazda, we always offer competitive pricing on automotive maintenance, and our experienced, reliable service and parts departments are open extra hours to help fit our customers’ hectic schedules. We are a Louisville Mazda dealer that makes customer satisfaction our highest priority, and our staff is committed to achieving this goal in every aspect of our business. Give us a call at (502) 894-3425 to schedule a test drive or your next service appointment. Feel free to stop by our convenient location at 7913 Shelbyville Rd to see any of our vehicles in person, or just to say hello. Visit Oxmoor Mazda today to see why so many satisfied customers have come from as far as Elizabethtown and Frankfort, KY, to find the perfect vehicle for their lifestyle and budget.